Search terms: Bicycle Cycling Bag, ROSWHEEL DRY, Full Waterproof, PVC, Rear Tail Saddle Bag Features: Full waterproof series,tail package Light riding material,riding without burden PVC folder cloth fabric,water droplets can not stay,a wipe that dry Made of PVC net clamping cloth,do not leak,not seepage,durable Do not use zipper, scroll design,not let a drop of water into Description: Waterproof Lightweight PVC, easing burden with comfortable and relaxed bicycling experience. 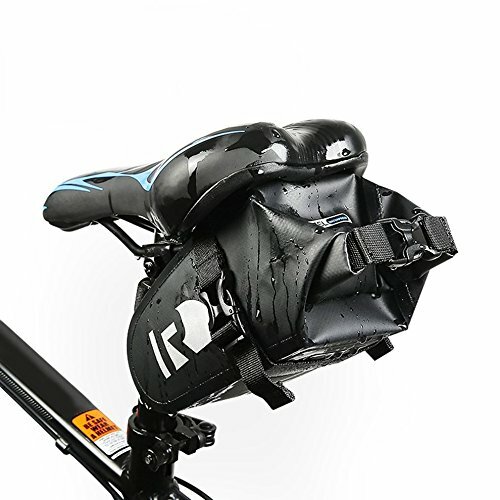 Seamless Technology- Water and splash resistant, works well to prevent rain or water drop into the bag, just enjoy the amazing riding Adjustable nylon tape and Buckle- Allow you to freely adjust the tightness, extremely convenient and practical. Specification: Material: PVC Color: black Size: 18.5*11*9cm Package included: 1 x Bicycle Full Waterproof Rear Tail Bag Note: Due to the difference between different monitors, the picture may not reflect the actual color of the item. Please allow slight deviation due to manual measurement. Thank you!